Next to Sunset, Wilshire Boulevard may be one of Los Angeles' most iconic streets: a 15.8-mile ribbon stretching from its historic core to the Pacific, the address of some of its most celebrated Art Deco architecture, the axis of the its so-called linear downtown. But in 1922, much of Wilshire was little more than a lonely country road. Giant billboards spoke of new real estate developments rising from the fields of barley—a promise that passing motorists might have greeted with some skepticism. After all, methane gas bubbled up from the bowels of the earth here. Sticky asphalt seeped through the ground. Oil derricks loomed nearby, their drills noisily thrashing into the earth. 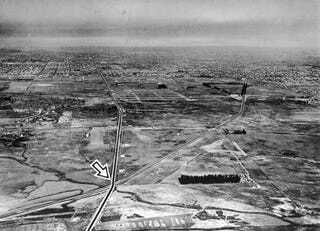 That's the scene pictured in the above aerial photograph, which looks east in 1922 above the intersection of Wilshire and San Vicente. But time would vindicate the billboards. Within a few decades, that lonely stretch of Wilshire became L.A.'s Miracle Mile—for a time, the city's premier shopping destination. Housing subdivisions sprawled over the former barley fields, and high-rises huddled around the onetime country road. The oil derricks fell, replaced by the towers of Corbusier-inspired Park La Brea. The asphalt pits became a major tourist attraction. Top image courtesy of the USC Libraries' Los Angeles Examiner Collection.